This week, following the review of SimplyMEPIS 11, I will be looking at the latest Kanotix release. 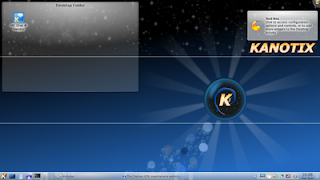 Kanotix is one of the older Debian derivatives and was inspired by the Knoppix Live distribution, also based on Debian, for which the founder 'Kano' had his own ideas how to improve it, like adding a hard drive installer. 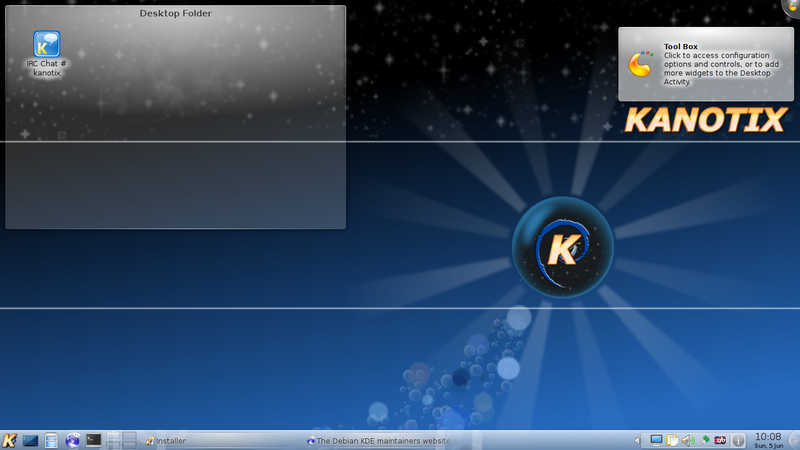 Knoppix was at the time using KDE as the main desktop but has changed since to LXDE. 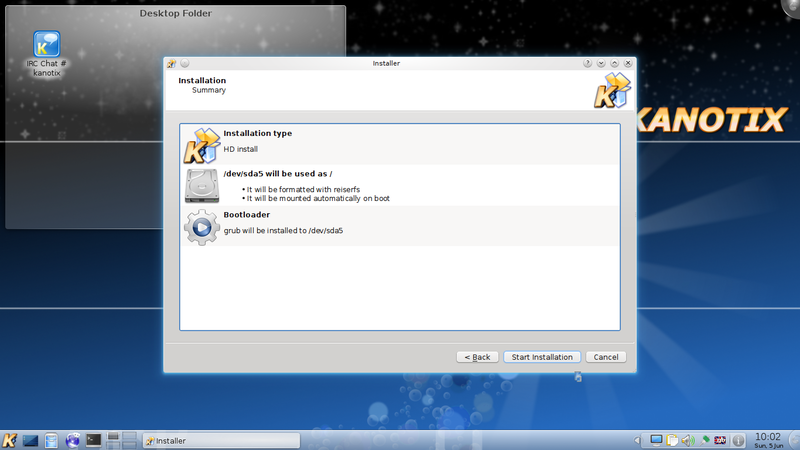 Earlier Kanotix releases were based on Debian Sid. With the last official release in December 2005 the project went into a phase of semi-hibernation in which until 2007 several Release Candidates were issued. In the following period kernel updates and backports were made available, and it seems some experimentation went into customizing for netbook and laptop use. Read more on Wikipedia. Kanotix reemerged in June 2010 with a new release and is now based on Debian Stable. 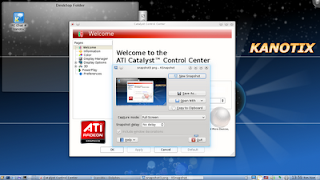 The current stable version was released in May on the occasion of LinuxTag 2011 in Berlin. The distribution is available optimized for i686 (32 bit) and for x86_64. The ISO's are around 1.2 GB and 1.3 GB respectively. A hybrid image of the combined size is also available. I went for the 64 bit version at http://debian.tu-bs.de/kanotix/KANOTIX-Hellfire-2011-05/kanotix64-2.6.38.iso and installed it on my relatively recent Acer Aspire 5551 laptop bought just September last year. It sports ATI HD 4200 Mobility graphics, AMD Phenom X3, 4 GB Ram, and Broadcom chips for wired and wireless networking. I usually have to install the firmware myself and some distributions do not support the wired tg3 Ethernet either. Kanotix is described on the web site as an up to date Debian stable that "recognizes more modern hardware than any other operating system in use today." It is using a monolithic kernel. The boot screen offers several options for normal boot, with (proprietary) graphics drivers, or fail safe, in German (which is the first choice here) and US English, plus the old faithful memtest. It takes a fair bit of time for the DVD to load, but once the boot process is over and done with you're brought straight to the desktop, no login required. This makes sense for a system also described as a tool for rescue tool and forensics work or simply for safe surfing. It however makes your partitions vulnerable to anybody with access to your PC, but that goes for a most Live distributions, and requiring a root password which is often for convenience sake displayed on the login screen would only add an extra layer of protection to the user to remind him that what he is about to do can have consequences, but it would not prevent somebody with physical access from tampering with your system. In this context I am thinking full disk encryption or at least setting a BIOS password. On the desktop in the live session Kanotix felt very responsive, perhaps slightly less so than the hyper SimplyMEPIS, but fast enough. I am finding that newer Debian based systems definitely feel a lot faster than Fedora or Kubuntu, or even some other Gnome based distributions. I am speculating that this is a combination of improvements due to the underlying Debian base and distribution specific optimizations to KDE. We get a KDE 4.4.5, the same version that is in Debian 6.0 Squeeze, with a few more applications thrown in on top of the standard collection. This may seem and look a bit dated already, but is up to the task and has the advantage of being stable and having been through a long testing phase with Squeeze. But I have to admit to getting confused at times with all the subtle differences between the various flavours still in circulation, with plenty of changes between 4.3 and 4.6. A small collection of KDE wallpapers is also present, until you have time to load your own, and the overall theming is pleasant, nothing to write home about but consistent with the login screen and boot splash and with a light feel to it. My screen resolution was properly detected, as were my network and wireless interfaces, but no networks showing up in KNetworkManager. A quick check confirmed that in fact neither the broadcom-sta driver nor the brcm80211 firmware were installed. So my hardware is recognized as claimed, but not supported. The desktop is definitely far more KDE 4 style than SimplyMEPIS, with Kickoff menu being the default and the typical Folder View plasma widget. Here the newbie or not so newbie can get quick access to the Kanotix IRC channel to get help solving any installation problems. A good idea to have this prominently displayed on the desktop, and indeed the response is good, with more than 40 users incl. 'the man' Kano hanging out there, and not only that, responding too! There's more help available on the project's website, incl. a very good Wiki in the style of a user guide or manual in German and in English, but the forum appears to be German only. Firefox IceWeasel in a somewhat more 3.6 resembling style has been helpfully fitted out with bookmarks to the Kanotix home page and a few others that I really enjoyed. Site feeds from Slashdot, Phoronix, LXer plus a few German Linux and news feeds, mostly interesting for geeks, but then who else has heard of Kanotix? Proprietary graphics drivers included and working! I did not experience any crashes on the desktop, no freezes and no jerkiness and touchpad and mouse were working fine. Booting up from the gfx option all the desktop sugary visual effects worked fine. Overall a happy live session, and the installer can be launched from here too, so it can run in the background while you surf, or upload screenshots in my case. It is possible to add and remove programs in live mode due to AUFS. Kanotix does not come with VirtualBox guest additions preinstalled, thus I only got a basic resolution of 800x600. There is nothing to remark here except that it worked. There only seem to be the sources for the Debian Squeeze 2.6.32 kernel in the repositories (all were enabled), but as Kanotix comes with a much newer 2.6.38-7 Ubuntu kernel you would have to get the source from there. 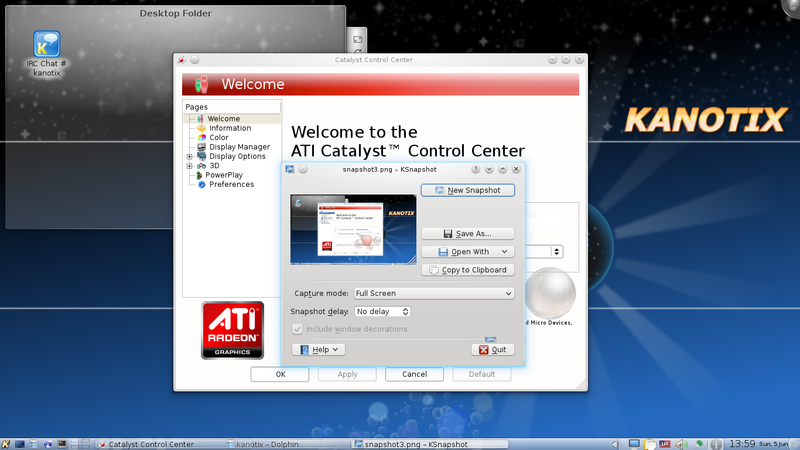 A graphical installer, acritonix, can be found under the Kanotix entry in the main menu, the entry disappears once the system has been successfully copied to drive. It is a bit basic but does the job, but it's definitely not for beginners. There doesn't seem to be an option to auto-partition the disk, instead you are asked whether you already have partitions or want to manually partition. Users then get a choice of fdisk, cfdisk, and Gparted. All good programs, but perhaps not if you're just starting out to earn your Linux spurs. The process of assigning additional mount points is neither clearly explained nor laid out. Funny enough, I ran into a problem in the beginning which I was unable to replicate. All in all I installed the system three times, first to the laptop's hard drive, then to VirtualBox, then again to the laptop. After installing the first time and rebooting my chain loader entry in the Grub that's sitting in the MBR on sda did not detect Grub2 on sda5, where I had obviously told it to be. Fortunately it's trivial to add the entry direct to the boot menu. I was also unable to log in both to my user account and as root, even in the console. Thinking this may be a problem with installing Grub2 to a partition with reiserfs, similar to this bug (Grub-legacy), I tried the virtual route, this time with a dedicated hard drive and to the MBR, using reiserfs again. No problem here, Grub2 came up and this time I was able to log in. Went back and repeated the proper install, and was able to log in as the user I had created here as well. No idea about Grub2 because I'm sticking to direct loading now, but it seems the problem first time around was just a fluke. Once all questions are answered the system installs in nine minutes on this X3 machine, not bad for something weighing in at 1.3 GB. I was positively surprised to find that Kanotix had kept all my settings and changes from the live session and carried them over, wallpaper, screenshots, slimmer panel size, desktop effects, and it installs exactly the session that was chosen, i.e. it installs the proprietary graphics drivers depending on your hardware Nvidia or ATI/AMD if you chose to boot with gfx enabled. No more headaches on Debian, just install Kanotix. Fonts are looking good enough for my taste, but a bit thinnish. That's the case on most Debian based systems, but some people can get obsessed about their fonts. You might want to consider ttf-mscorefonts or the liberation fonts (ttf-liberation) which are available in Synaptic. The installed system took up close to 4 GB, quite surprising considering the SimplyMEPIS 11 ISO of similar size the other day took up only 3.49 GB, also on a reiserfs formatted partition, but slightly more on ext4. It seems Kanotix has packed in a few more goodies. On top of the aging KDE 4.4.5 with the usual desktop applications contrasting with a strangely bleeding edge 2.6.38-7 recompiled Ubuntu kernel you get a couple of games, Skype, Wine installed by default in version 1.3.19 (with 1.3.21 already in updates) from the Ubuntu repositories, HP printer drivers and fax utility, Pidgin and Gnome Mplayer as Gtk2 programs, the GIMP, Kaffeine (a great KDE media player dare I say) instead of the usually shipped DragonPlayer, Gparted for the disk and old favorite Synaptic for package management needs. KWrite and Kate for editing. Iceweasel and Icedove for your web and email needs, sticking close to upstream. Java is also there if you need it. A really cool program is glbenchmark which is spectacular to run if you installed the proprietary drivers. Ntfs-3g as standard for accessing shared drives. So what's missing? Strangely missing is Blogilo, because I find it in most distributions that come with KDE by default these days. There's also no FTP or Torrent client, which can be remedied in under a minute incl. 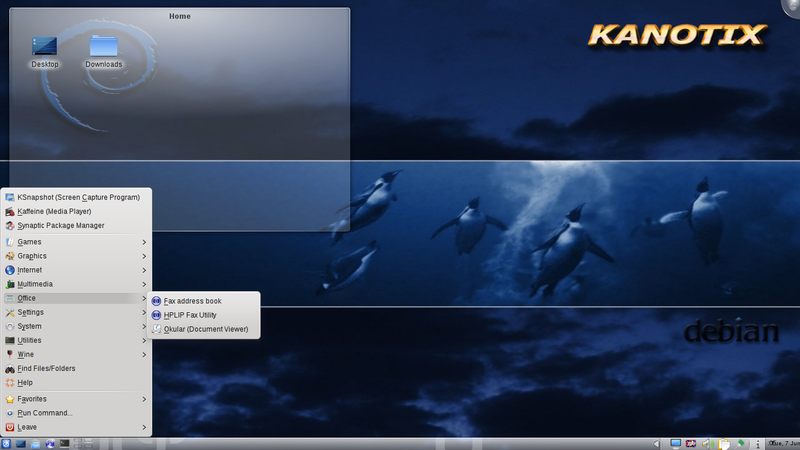 getting a nice plasma widget to keep up with Ktorrent's activity on the desktop. Perhaps a backup manager would be good. 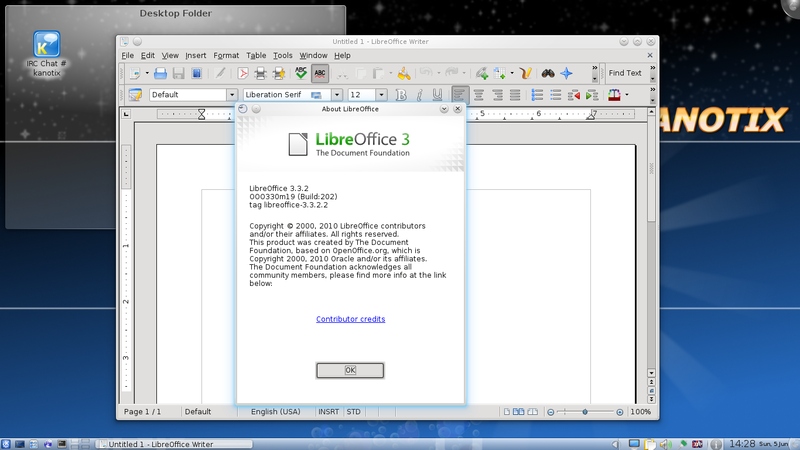 LibreOffice, that I'm sure I saw in the live session, did not get installed. No proper email client, no Gvim. Not a big deal as it can be changed quickly. Several but not all multimedia codecs are preinstalled. Kanotix comes with Quicktime and DivX browser plugins, also RealPlayer and the Windows Media codecs and plugins. I was able to watch an MP4 stream embedded in a web page, full-screen and with animated zooming in and out, very cool. Ogg unfortunately didn't scale at all and the video remained in the upper left corner. Adobe Flash is missing from the distribution but can be installed via script or from the repositories with apt-get. Kanotix of course has like all Debian derivatives access to the huge selection of packages that community provides. Currently there are 28981 packages listed in Synaptic, from three major sources, mainly Debian (no surprise), Kanotix' own packages, and the ubuntu-wine repository at launchpad. Here users will also find find the package flashplugin-nonfree that is supposed to download and install Flash from the Adobe website. Unfortunately the debian-multimedia repository has not been set up for us. This would have been the icing on the cake. You will need to get libdvdcss from there if you wish to watch your content scrambled commercial DVD's. In case of system tools, you get the KDE tools and that's it, no special Control Centers or other distribution specific assistants that would help a user manage, not much handholding. Kanotix is clearly aimed at more advanced Linux users who already know how to partition and who will not be thrown of course because the installer looks different or a bit basic. Somebody with some familiarity with the Debian system, not necessarily (K)ubuntu because it is doing almost everything for users. Somebody who is not afraid to learn to compile their wireless driver on Debian, track down kernel sources and create one or the other package. On the other side, you already get your graphics set up for you, and several more goodies right from the start. For somebody considering to switch, it may also be important to keep in mind that although the Wiki is also available translated into English, most users seem to speak German and the forum is German only. The tone there can be a bit rough, almost rude, but one could argue this is just how Germans talk. Taking into account anti-discriminatory practice it's their cultural right to be obnoxious. This may turn out to be a hindrance to successful adoption. However if you're confident with this distributions' parent, all documentation that applies to it should also apply to Kanotix. I quite like Kanotix and its somewhat odd blend of older KDE, access to stable packages, and a brand spanking new kernel, and the feeling of a small dedicated community of Tux friends. Think I'll give testing a rest on sda5 and keep Kanotix around for a while. Update: Following a comment from TheOne I decided to go back and investigate. 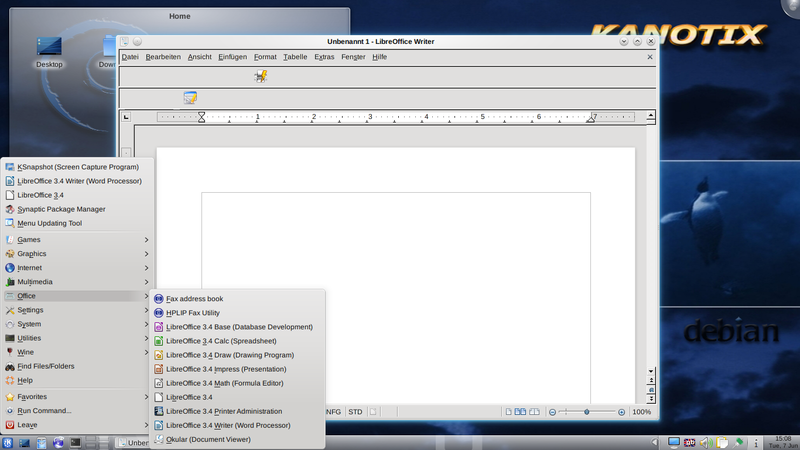 As it turned out LibreOffice got installed but was missing from the KDE menu. See screenshots. Unfortunately adding it to the menu turned out not to be easy. Menu updating tool did not find LibreOffice, neither did starting from console or the run command work, trying office, libreoffice, openoffice, staroffice etc. to no avail. This has got to be a bug. Hope they can work it out. Perhaps reinstalling will help? Hope that helps. No more updates now, thank you! 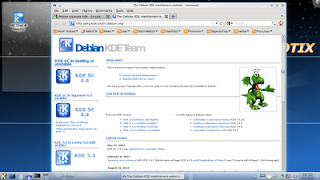 Yes Kanotix is created to run Debian without headache not to be a debian-based Kubuntu. 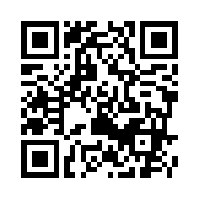 The Kanotix-Forum is in German AND English and you will find it under the German part. Everybody asking in English in Forums and Chat will get the answer in English. After the leaving of team members to sidux, the team and the major part of the active community was German and the English part was abondanded, but with more activity of English-speaking users and members this would change. Thanks for clarifying, that is good to know. Let's hope then that more international users get involved again. Btw, my remark at the end about cultural differences is a bit tongue in cheek - 50/50. Thank you very much for your awesome feedback! A lot of people only copy&paste the release note, kick up a virtual machine and say they tested it. So I repeat myself, thank you for really testing it. As it was mentioned by the previous comment, everything is available in german and english (website, forum, wiki, chat and the system of course). Some parts are not as active than the german parts, not surprising because most involved people come from Germany. 3. LibreOffice should be there after installation too, are you sure it isn't? Kano manages a lot of thinks via short instructions (factoids) in IRC. So I really can recommend the use of the chat. 2. In regards to the Flash player, I did not see any script but installing flashplayer-nonfree from the repos in Synaptic worked just fine. Not sure, but maybe you can display it more prominently somewhere easier to find? 3. I went back to investigate where LibreOffice went and you can see it in the update to the article. Only an issue of adding it to Kmenu. 4&5. Quite sure having backup from the start would make Kanotix even better. Re. Blogilo, not that many people are using it, those who want can always add it. I was just commenting because many seem to include it these days, like Fedora nd Kongoni. I think having FTP or Ktorrent would be more important. Thanks again, nice communicating with a responsive team! Knoppix was at the time using KDE as the main desktop but has changed since to LXDE. Are you sure about this statement? It seems to me it comes with KDE 4.4.5 not LXDE. Uuh? A difference between CD and DVD maybe? I don't know, or it's back in and wasn't for a while? Right, I know how I got that impression. Looking at http://en.wikipedia.org/wiki/Knoppix LXDE was the default in 6.0.1, which was the last one I tried. Knoppix (CD&DVD) still (6.4 + 6.5) comes with LXDE. Your comment about the Germans and their culture in the Forum is really great - and true. I'm a German Linux-User - but I prefer the English Forums. They are more politely, sure! For example the Forum of Crunchbang Linux #!